We’ll get the final results in a day or two, but we aren’t expecting anything other than a confirmation of the initial findings. It goes without saying, I am incredibly relieved. I’m also relieved on the recovery front, as I feel much, much better than I anticipated. I stopped taking the prescription pain pills after my second dose (Saturday morning) because I honestly felt like they made me feel worse, not better. I took Advil instead through yesterday afternoon and haven’t taken anything since. I have some slight discomfort at my incision site, but it’s not really painful as long as a little person doesn’t accidentally slap or headbutt it. Most of the immediate aftereffects of the surgery (sore throat, hoarseness, difficulty swallowing) have disappeared, and so all I have noticed is a decreased energy level and slight shortness of breath. With the incredible help of my dad and his wife Sandy, and Chris, I gave myself a vacation from everything this weekend and pretty much slept Saturday and Sunday away. Luckily I have the best little cuddle bugs. Today I was closer to normal, although I definitely still needed an afternoon nap. Chris had to go back to work, but my wonderful friend Chantry brought her girls up for a play date and then offered to watch all four girls while I snoozed for an hour, which was amazing. (Chantry, you are the best friend ever.) I’m feeling back to normal enough that I even got a little work done this evening, though judging by my energy level I will probably not be working late nights this week. Honestly I can’t complain if needing extra sleep is the biggest after affect of the surgery. I thought I might take a minute to write about my experience breastfeeding after surgery, since whether or not it is OK to breastfeed after surgery is one of the topics I often see come up as a lactation consultant/LLL Leader. On Saturday, I instagrammed this photo which was taken early Saturday morning, about 15 hours after I got home from surgery. Most doctors will tell their patients that they need to wait 24 hours after being given anesthesia to resume breastfeeding. From the beginning, I was very upfront with both my surgeon and my anesthesiologist that I am still breastfeeding Zara and that I wanted to be able to resume as quickly as possible following surgery. I never expected to wait the full 24 hours that is the standard recommendation, and I was proactive to ensure that any medications I received were compatible with this plan. A week prior to surgery, I called the anesthesia group that works at my surgery center and got both the names and expected amounts (in ranges) of all the medications I might be given in surgery; then, I looked each medication up on LACTMed, a database of drugs and supplements specifically for breastfeeding mothers. In my discussion with the anesthesiologist, I determined that they typically use both Fentanyl and Dilaudid as a general anesthesia. Fentanyl is often given epidurally or intravenously during labor, and there is no waiting period or discarding of milk is required before resuming breastfeeding after Fentanyl is used for short procedures or in general anesthesia. Dilaudid, found on LACTMed under the name Hydromorphone, is more concerning as a narcotic that can be passed through breast milk. There is much less research available on breastfeeding following Dilaudid use in general anesthesia. When I expressed concern about this over the phone, I was told that I could decline it on the day of surgery and would be given solely Fentanyl, which I did when the anesthesiologist came into the room to meet me prior to surgery. I also made sure ahead of time that the pain pills my surgeon prescribed for after surgery were compatible with breastfeeding. The pill I was prescribed was Tramadol, which is considered acceptable for use in breastfeeding mothers as the amount passed through milk is less than any amount that would be given to an infant directly if the infant needed pain medicine. Between the phone call, research online, and discussions with my doctor, it took me about 45 minutes to ensure that the medications I was receiving were compatible with breastfeeding and did not require me to “pump and dump” for 24 hours as I was initially instructed by my surgeon. Once I figured out what medications I was OK with, I made a point of being very clear about the fact that I am a breastfeeding mom to every person I met on the day of surgery. For added effect, it also worked out that Zara came with me to pre-op and nursed right before I was taken into surgery. This served double duty: primarily, it helped to minimize the amount of time between pre- and post-op nursing sessions (and decrease any possible engorgement, etc. ), and secondarily, it was a visual reminder to my surgical team that I am a breastfeeding mom. 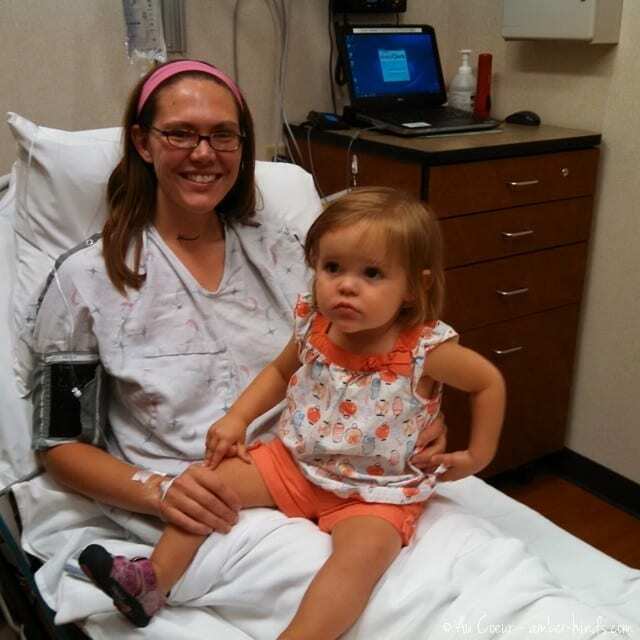 Zara nursed around 1:45 and I was taken back to surgery at 2 p.m. I got home from surgery around 8 p.m., but at that point I was not feeling up to nursing Zara because I was still pretty out of it from the drugs and from the fact that I had not eaten for over 24 hours at that point. Not being able to nurse Zara to sleep was the roughest part of coming home from surgery. It took Chris a long time to get her to sleep and there was a lot of crying, which was very hard to listen to, even through my haze. If I had a choice, I would have wanted to have the first surgery of the day so that I would have had time to recover before the oh-so-important bedtime nursing session, but we had to work with what we were given. After his heroic bedtime efforts, Chris made me food and tucked me into bed, so that I was well rested and no longer starving when Zara woke up around 1 or 2 a.m. At that point, I decided to nurse her in bed with me rather than making Chris try to get her back in bed — even after surgery, nighttime nursing really is as easy as latching them on and falling right back to sleep — so she first nursed about 7 hours after I got out of surgery. I think we all would have been much more disturbed and sleep-deprived if I had not been able to nurse her then; also, by that point if I had not nursed her, I probably would have had to have pumped which would have made me lose sleep as well. Over the weekend, I was so glad that Zara was still nursing. It helped take some of the burden off of Chris, because I could still help with the parenting during nap and bedtimes even when all I could do was lay in bed. It gave me moments of closeness with my littlest girl despite a distinct lack of energy. And I also think that being able to nurse helped Zara — it kept her from noticing that something was off. Nora was a lot more sensitive and clingy on Saturday and Sunday than she would normally be, but Zara was happy as a clam. 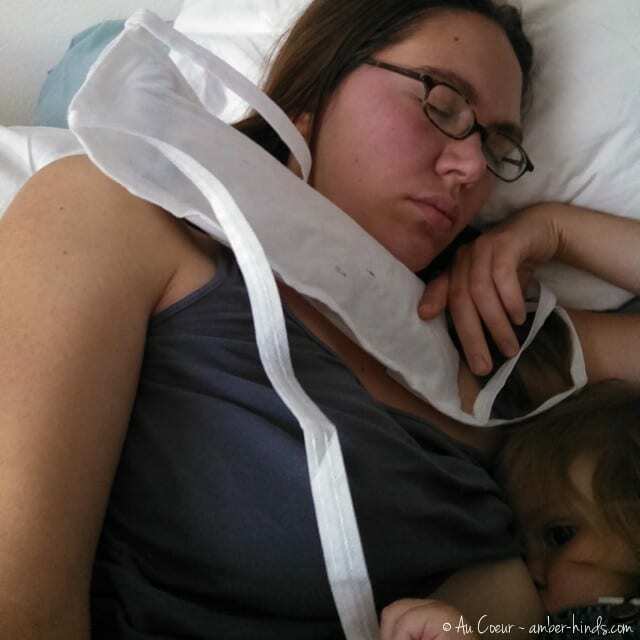 I’m lucky that this all came about when she was an older baby who nurses more for comfort than food, so nursing Zara after surgery never felt overwhelming or like it was too much to handle. I’m so glad that I worked with my medical team to make it possible for us to return to our routine as soon as possible and without me having to use a pump. Great post, with some great tips for breastfeeding mums. Thanks for sharing your experience (and pictures)! Thank you so much for coming out, Sandy. The girls had a great time with you and I know that Chris was glad to only have to worry about one little one during that first rough bedtime.